IR pens provide interactivity without needing to install the laser module. Physical attributes. Most of the ports, along with the power connector are on the front panel, meaning the side facing the screen. The exceptions are the one HDMI port with MHL and one mini-USB B port for power, which are meant primarily for the ViewSonic or third party wireless dongle. With the PS750HD sitting on a table, both of these ports are in a compartment on top, hidden underneath a panel. The panel is held on by two screws, which helps prevent casual theft of the dongle. The security bar is along the bottom edge of the front panel, near the right side as seen from the front, and just to the right of the Kensington lock slot. The intake vent is on the left side as seen from the front, with the exhaust vent on the right. The two 10-watt stereo speakers are on the left and right sides, near the back panel in both cases. The window that serves as a lens is on top, in a recessed area near the back panel. Low Lamp Mode. Eco mode is roughly 66% as bright as Normal mode. There are also two other Eco settings, although they are not Eco modes in the usual sense. Dynamic Eco works much like an auto iris to dynamically adjust brightness based on the image contents. It also lowers power use and lengthens lamp life. SuperEco drops brightness over time if the image remains static, then raises the brightness as soon as the image changes. Presentation Optimized Lumens. Standard color mode without changes offers the best balance of color quality and brightness. Measured at 2,190 ANSI lumens, it is easily bright enough for the PS750HD's maximum 110" diagonal image size to stand up to moderate ambient light. It also delivers saturated, vibrant color for graphics and acceptably realistic color for photos. Brightest and Dynamic modes are both brighter, but Brightest is obviously green even with graphics, and Dynamic has a yellowish green cast. Video Optimized Lumens. Movie mode delivers acceptable color for most purposes for video and film, with a slight blue bias. A little tweaking brings the color much closer to neutral with only a small drop in brightness to about 1750 ANSI lumens. Even at this level, the PS750HD is suitable for a 110" diagonal image in moderate ambient light. Brightness Uniformity. 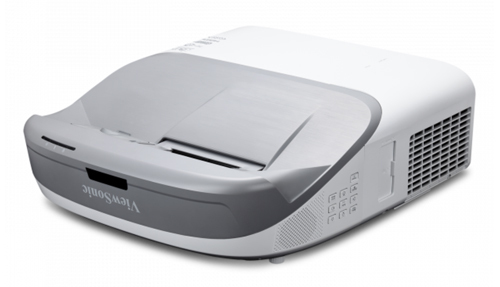 The PS750HD measured a solid 81% brightness uniformity, which is better than most UST projectors (as well as many longer thrown projectors) can deliver. Rainbow artifacts. The PS750HD does a remarkably good job of avoiding rainbow artifacts. We didn't see any with our graphic test images. With video and film clips, a few showed in scenes that tend to cause them, but they were both few and fleeting. Input Lag. The input lag is 17 ms with the 3X Fast Input option On, and 33 ms with it Off, which is the default setting. Throw distance. When using the included mount with most screens, the throw distance from the front of the projector ranges from 2" to 8" with the diagonal image size ranging from a minimum 80" to a maximum 110". However, a thicker-than-typical screen can limit the mount--and projector--to a smaller maximum throw distance and image size. The 0.22 throw ratio is based on the location of the window that serves as a lens, which is 13.5" farther from the screen. Mounting. You can set up the PS750HD on a table below the screen, in a wall mount above it, or in a vertical mount, facing straight down for a tabletop interactive display. With the projector sitting on a table, the bottom of the image is a little more than 15% of the image height above the top of the projector. Interactive setup. You can mount the laser curtain module using the four screws it comes with, but if you're using a whiteboard as a screen, the two magnets embedded on the back will hold it in place without needing to drill holes. The module also comes with one cable for connecting to the PS750HD and another for connecting the projector to a USB port on a computer. As tested, the instructions for setting up the interactive feature are confusing enough that we needed to call ViewSonic's support line to get it working. However ViewSonic is aware of this issue, and is planning to update the User Guide. Special screen considerations. As with any ultra short throw projector, you need a screen that's as flat as possible to avoid distortion in the image. In addition, to make best use of the interactive feature, the screen should be rigid as well as rugged enough to stand up to repeated touching, drawing, and writing with fingers and IR pens. A standard whiteboard is an ideal choice. 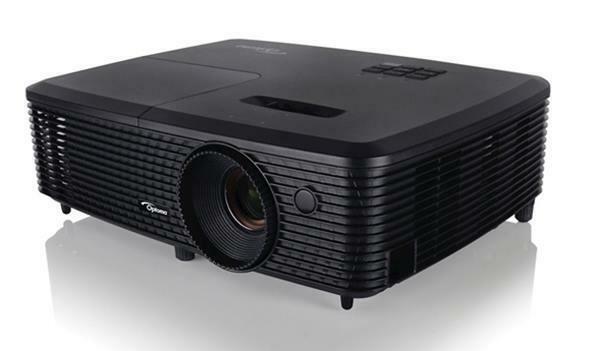 At $2059.99, the ViewSonic PS750HD is one of the least expensive 1080p, ultra short throw, interactive projectors on the market. It is absolutely the least expensive at this writing that includes everything you need except a screen: the projector itself, the laser curtain module for 10-point touch interactivity, two IR pens that work alongside the touch-interactive feature or by themselves, a wall mount, and annotation software as a free download. 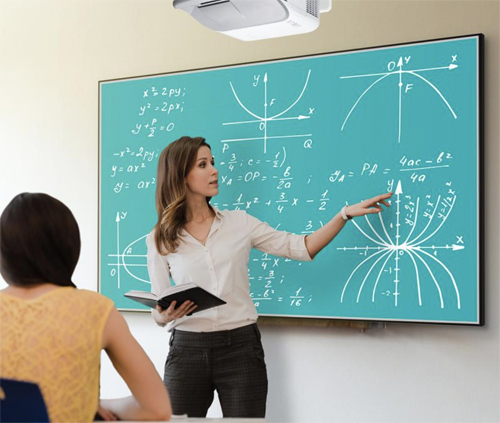 Although designed primarily for interactive presentations or the equivalent of an interactive whiteboard, the PS750HD offers first-rate image quality for any text or graphics-based presentation and handles film and video well enough to use for a full-length movie. The PS750HD's ability to be mounted facing straight down also makes it an ideal choice for an interactive table top solution. And its 3,000 ANSI lumens deliver ample brightness at its 110" maximum screen size to stand up to bright ambient light. Welcome touches for the PS750HD include both vertical and horizontal keystone adjustment and four-corner control for easy setup; support for Crestron Roomview, AMX, and Extron for controlling it over a network; and the dual 10-watt stereo speakers, which deliver enough volume for a small to medium size room. Also adding value is the 3-year warranty with 1-year Express-Exchange service and 1-Year warranty on the lamp. Beyond that, replacement lamps are just $59, keeping running costs low with the 3,000-hour lamp life in Normal mode and even lower with the 7,500-hour life in Dynamic Eco mode. 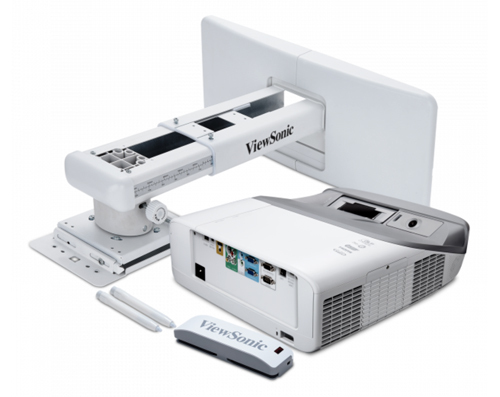 All this makes the ViewSonic PS750HD a total interactive package and an excellent value as an interactive 1080p projector for any classroom or conference room.